You want to go to Ladakh, and have heard of Tso something, Changtang, lakes on the high Tibetan plateau, and you wonder what is behind these appellations? I propose a small deciphering of these terms through the presentation of the three main ladakhis lakes. Already, let’s start with a short tour of the region: Ladakh. Ladakh is the small part of India, to the east of the state of Jammu & Kashmir, which, unlike the rest of the state, has a predominantly Buddhist population. The environment in Ladakh is mainly dry, as the area lies on the high Tibetan plateau. It is because the environment and culture of Ladakh are very similar to those of Tibet that it is often called “Little Tibet”. But Ladakh is not only the Himalayan mountains and the highest mountain passes in the world, it is also the area of Changtang, on the border of Tibet. On this plateau, the only populations are nomadic, and live off the breeding and the trade that they derive from them. The majority of the Changtang Plateau has been classified as a nature reserve in order to preserve this incredible natural environment. It is one of the few places in India where one can sometimes observe Kiangs (wild donkeys of Tibet) and cranes with black neck. Living conditions in Changtang are particularly difficult given the altitude (over 4100m) and the desert climate that can be likened to the climate in the Arctic. It is a vast mountainous area, but also adorned with magnificent lakes whose intense blue water contrasts marvelously with the ocher of the mountains and the white snow-capped peaks. 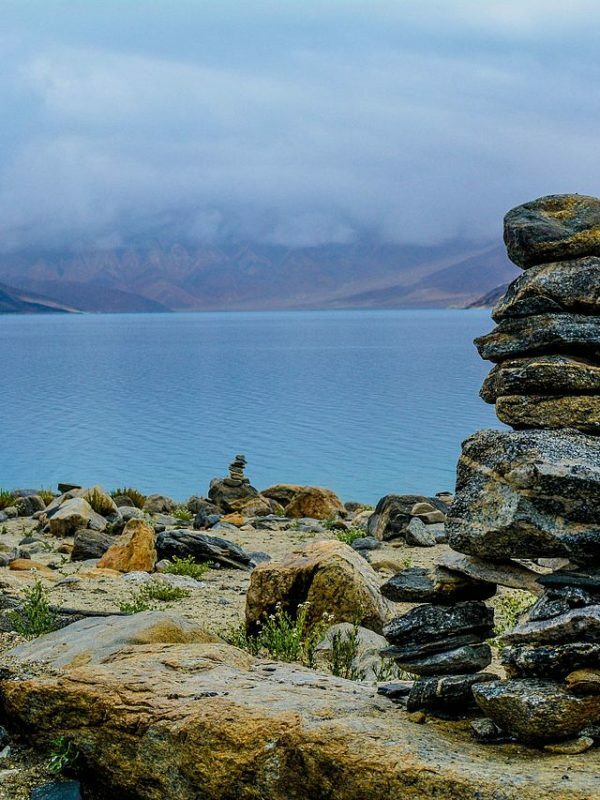 In Ladakh, you can discover 3 of these fantastic saltwater lakes of Changtang: the Tso Kar, the Tso Moriri and the Pangong Tso. Tso Kar is the most visited lakes in Ladakh, as the most accessible. It is also the smallest but it is extremely renowned for the beauty of the landscapes and animal life in the surroundings. Located at 4600 meters of altitude, it is called the White Lake because of the layers of salt and borax that cover its banks. Bird watchers will be particularly pleased with Lake Tso Kar as many species come to shelter in the nearby marshes. Rapacious and volatile, we find everything! And if we imagine India as an overpopulated country, still in action, we discover another facet of the country. Here, difficult to cross more than a dozen nomads in one day. A good breath of fresh air and the opportunity, in short, to recover a little calm and quietude. Not far from the Chinese border lies this lake that seems out of time and out of civilization. With the exception of a small village on the water’s edge, it is difficult to find the slightest trace of humans even though the largest building remains the monastery of course. Along the banks of the lake, one can hardly believe that the landscape around us is real. We really discover the immensity and simplicity of Ladakh. Since there is very little vegetation and especially very few trees, the view is clear and the mountains rise dignified in front of us, imposing. In the distance you can see the pastures where Ladakhis breeders bring their flocks of yaks, sheep or goats. The sky is intense blue and bright, so pure that it reminds me of Yves Klein’s famous painting “Monochrome de Bleu”. I will keep in memory this landscape so “live”, so simple in the forms, colors and elements but so hypnotizing, captivating, dazzling, magical Words sometimes lack to describe the feelings that take hold of us face To such masterpieces of nature! The Pangong Tso stands out from the previous two lakes by its size. The contrast between the mineral gray of the mountains and the intense blue of the lake’s water is striking. In front of us, an immense expanse of water. Difficult to say how many kilometers separates us exactly on the other side but what I can tell you is that this other side is in Tibet! Out of reach, unattainable! The snow-capped mountains are reflected in this immaculate water, which gives the landscape a sort of perfect symmetry somewhat disturbing. In the evening, after dark, near the Pangong Tso, we admire this sky dressed with thousands of stars. It is good to savor this moment because back in New Delhi, it will no longer be possible. Here, in this case of infinite nature, we are cut off from the world. Nothing can reach us. We are in perfect communion with nature. The next morning, we get up early to be able to admire the sunrise. Not far from our guest-house, a small path allows access to a hill. The view over the area is breathtaking. Here is my tour of the main . Some may think “a lake, it’s a lake, once we’ve seen one, we’ve all seen them.” Well, no, I do not think so. Each of the lakes I visited in Ladakh had its own attraction, its own charm and distinguished itself from others because of its location, the meetings we had with the local population, the absence or presence of Vegetation, the state of the sky, the sun and the atmosphere given by the brightness on the day of the visit. For me, each of the lakes has been a unique experience with different emotions and memories.